The fact that growth in Netflix's top line is slowing at a rapid clip is not being adequately reflected in its share price. News that Netflix (NFLX - Get Report) is richly valued has been known for a long time and will not be a shock to anyone. What will be a meaningful shock, however, is the fact that Netflix's growth is forecast to meaningfully slow down. This insight is a game changer that is not being adequately reflected in Netflix's share price. Investors should act swiftly and use the opportunity to exit now before sentiment turns strongly negative. The main focus of Netflix's shareholder letter was on strong subscriber growth. But what the letter did not spend much energy on was highlighting the pace of revenue growth deceleration. Some readers might look at the above graph and wonder whether Netflix is being overly conservative in order to make it easy to beat estimates next quarter. But I strongly urge readers not fall into this faulty logic. The fact of the matter is that Netflix's top line is slowing at a rapid clip. Which brings up the question, how is it possible for revenue to decelerate in the face of strong subscriber growth? That's because the devil is in the details. Or lack of details, as is the case with Netflix's Q4 2018 shareholder letter. Looking back on previous quarters' letters, investors can see that international subscribers are meaningfully less profitable than U.S subscribers -- specifically, they're worth worth roughly one-third as much as a U.S. subscriber. In the past, Netflix was a rapid growth company that carried a multiple proportional to the fact that it was an innovative disruptor. 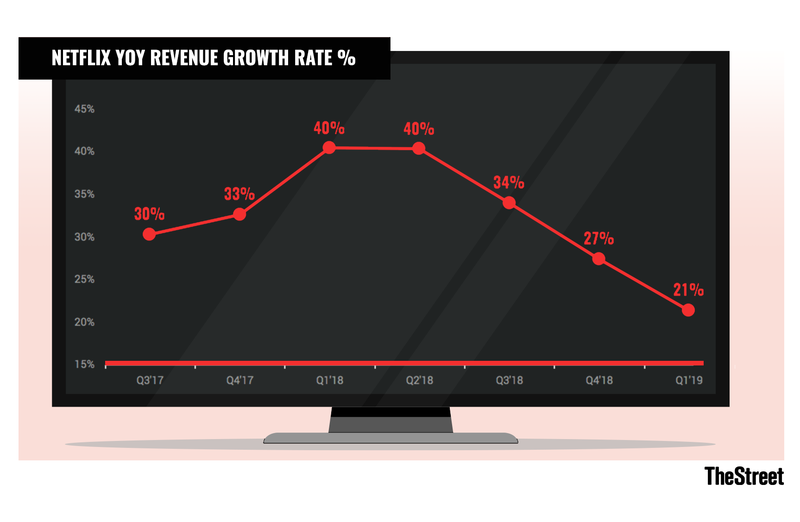 However, as the graph above highlights, Netflix's 30%+ year-over-year growth rates are likely a thing of the past. Netflix saw its debt soar by 60% year-over-year, while at the same time its top line only increased 35% in 2018. Furthermore, its content obligations also continued to increase and now stand at over $19 billion. In other words, while Netflix shows no sign of decreasing the burden on its balance sheet, this added burden is not being effectively translated into top line growth. That brings up a further problem. For as long as Netflix is perceived to be a high growth company, investor's sentiment will remain positive, allowing Netflix to continue to raise cheap debt from creditors. However, when equity markets start to lose confidence in Netflix as its growth rate slows, credit markets will also respond and make it expensive for Netflix to raise further debt. In fact, Netflix's interest expense in Q4 2017 stood at 2.3%, but in Q4 2018, it has already jumped to 3.1%. Further compounding issues for Netflix is the fact that its end market is highly fragmented. Moreover, Netflix claims that it holds 10% of television screen time. Although Netflix argues this is a positive, showing it has room for improvement, another way to look at the figure is to ask whether one should pay a steep premium for a company with only a small market share and a lot of competition? I argue that investors should not. Moving on, 2019 is expected to see heavyweights Disney (DIS - Get Report) , AT&T (T - Get Report) and Apple (AAPL - Get Report) launch their own direct-to-consumer video platforms. Consequently, not only does Netflix have to contend with slower growth and more debt and content obligations, but increased competition from companies with strong financial resources lead by highly capable management teams. In the past, Netflix's main competitive advantage had been its ability to stream high-quality, on-demand content at an affordable price. However, its recent push to raise prices by roughly 13% to 18% is likely to eat into Netflix's own competitive advantage, further hindering its growth as the go-to, affordable streaming content provider. This year is set to be a year where consumers will be presented with more choices than ever before in terms of what content they chose and at what price points. The competition will range from Disney to Apple to Amazon (AMZN - Get Report) Prime Video to Alphabet's (GOOGL - Get Report) YouTube and numerous other providers. Netflix has achieved a tremendous amount in a short amount of time. Now, the competition has woken up and is determined to take back market share. With only 24 hours in a day, the battle for screen time will be formidable. Disney, Amazon, Apple and Alphabet are holdings in Jim Cramer's Action Alerts PLUS Charitable Trust Portfolio. Want to be alerted before Cramer buys or sells DIS, AMZN, AAPL or GOOGL? Learn more now.